USA's Jason Brown performs to "Flow Like Water" by James Newton Howard. USA’s Jason Brown snatched the gold in the Junior Men’s event at the ISU Grand Prix of Figure Skating Final. China’s Han Yan repeated as a silver medalist and overnight leader Joshua Farris (USA) settled for the bronze. Brown didn’t risk a triple Axel in his program to Flow Like Water by James Newton Howard, but he executed seven triple jumps and fast, well-centered spins, collecting lots of positive Grades of Execution (GOE). 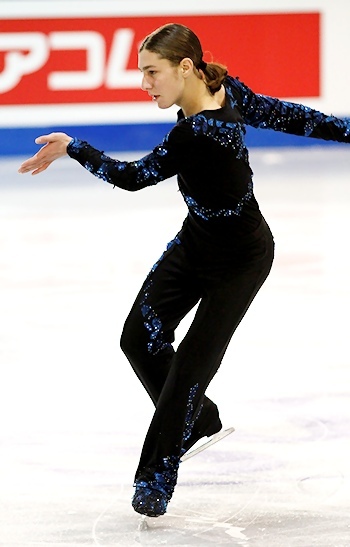 The 16-year-old improved his season’s best by 10.61 points with 139.64 points, and was ranked second in the free skating, but overall his total score of 208.41 points propelled him to the gold medal in his debut. Yan’s program to Zigeunerweisen featured a triple Axel, a quad toe, and six triples. The two-time Chinese national champion scored 141.70 points to win the free skating, and moved up from third to second at 205.93 points total. The only glitch in his performance came when he singled a toe in combination with a triple Lutz. The 15-year-old felt he could have done better. Farris hit a triple Axel and a triple flip-triple toe in his routine to Sergei Rachmaninov’s Piano Concerto No. 3, but he fell at the end of the footwork and crashed on the second triple Axel, slapping the ice in frustration. The 16-year-old earned 130.99 points and held on to the bronze with 203.98 points overall. Maxim Kovtun of Russia also landed a quad toe, but touched down with his hand. He produced six triple jumps in his fun program to Austin Powers to come in fourth with 193.76 points. The two Japanese men remained in fifth and sixth place. Ryuju Hino fell on a triple Axel, but landed five triples in his routine to The Matrix (172.75 points). Keiji Tanaka completed five triples (including an Axel) in his program to The Untouchables, but popped the second Axel and stepped out of a triple Lutz. Several other landings were shaky, as well. The 2011 World Junior silver medalist scored a total of 171.14 points.